Process cranberries in blender or food processor; pour sugar over cranberries and stir to dissolve. Bring 3/4 cup of water to a boil; stir in gelatin and let cool. Stir cooled gelatin into cranberries, and add pineapple, orange juice, apple and pecans. Mix well, cover and refrigerate overnight. Whip cream and beat in cream cheese. In a glass serving dish, layer half of the cranberry mixture, then the whipped cream mixture, then the remaining cranberry mixture. 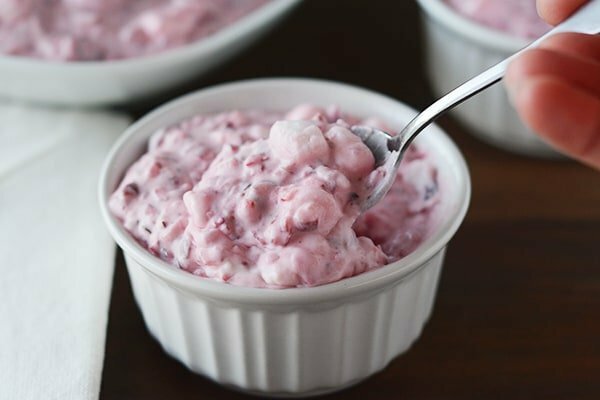 No comments for: "Creamy Cranberry Salad Recipe"